ADDRESS: 78 Regent Road cnr Cassell, Sea Point. OPEN: Daily dinner and Sunday lunch. Tables for 10 or more can be accommodated for lunch on any day. La Mouette Restaurant not only offers excellent food, but prides itself on the meticulous selection of complementary wines.With some of the finest wines in the world at their fingertips, La Mouette Restaurant has expertly matched food and wine to create a unique finer dining experience. 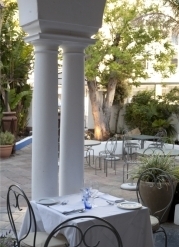 La Mouette Restaurant in Sea Point offers three dining rooms, one of which is aptly named the Winter Lounge. 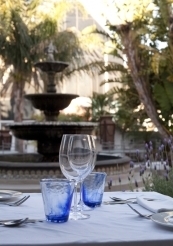 A Private Dining room, called the Mayor’s Room and an airy outdoor courtyard, complete with a fountain and 13 Koi, as well as five fireplaces inside, gives La Mouette a perfect atmosphere in both summer and winter.Try the Gin and Tonic Dessert - it comes highly recommended. 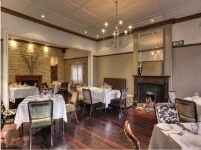 Hire this exclusive venue for weddings, birthdays, corporate functions or any special event. Sit down meals a maximum of 100 guests inside spread over 2 floors and 3 dinning rooms or 100 guests in the fountain court. 200 guests can be accommodated for canapés and drinks. The use of the full facility, inside and outside. Lunchtime: Minimum spend of R33 000 plus 12% service fee. 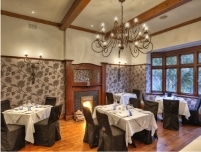 Dinnertime: Minimum spend of R50 000 plus 12% service fee. Contact Bib on 083 953 6144 to view or complete a Contact/Enquiry Form with all the details and we will get back to you with availability.